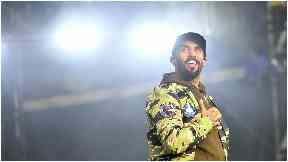 The R&B star will be performing some of his biggest hits at the city's Slessor Gardens. R&B star Craig David has announced a huge Dundee show as part of his upcoming UK tour. The singer, who released his first album in 2000, will be joined by DJ Sigala, singer Becky Hill and a live band for his summer show on Dundee's waterfront. It will be his only full Scottish show of 2019, however fans in Glasgow can see him perform a smaller gig in April. The Bo Selecta! star has sold more than 15 million albums worldwide and will be playing some of his most popular hits including 7 Days, Walking Away and When the Bassline Drops in Dundee next summer. He said: "I'm really looking forward to bringing my show and band to Dundee. It's going to be a blast; I've no doubt my fans will join me in making this a big night. "I'm a huge fan of Sigala who will be spinning some serious tracks, and Becky Hill has the most incredible voice and amazing hits, so I'm looking forward to having them both as my very special guests. "DJ and producer Nathan Dawe is on the up - and I am happy to invite him to open. "We know the fans in Scotland like to PARTY so bring it on, cannot wait to see you all!" To book tickets, visit www.ticketmaster.co.uk.